[editor’s note. To say again what I’ve been driving at in previous postings, the attempt here is to bring into the open a remarkable Yiddish-American poet whose master work, Processions, accompanies & may even prefigure the long-poem experiments of English language masters like Pound, Williams, & Zukofsky, with all of whom he was in contact. If so that might in itself suggest a rethinking of experimental American modernism & open the possibility of a multilingual history of twentieth-century American poetry. The groundwork here has been initiated by Ariel Resnikoff, in the form of a recent thesis in Jewish Studies, “‘Double Exposures’: Poetics of Resistance and Acculturation in the Works of Louis Zukofsky and Mikhl Likht,” at the University of Oxford, from which the present excerpt is taken. A complete translation of Processions by Resnikoff and Stephen Ross is currently in the works. Zukofsky and Likht arrived at a Jewish American modernist poetics from opposite sides of the language spectrum. Their respective choices embody a widespread linguistic fissure which emerged between immigrant and first-generation American Jews during the first half of the twentieth century. The sociocultural implications of this fissure greatly influenced both writers and helped shape the poetry they produced. Zukofsky’s “Poem Beginning ‘The”’ (1926) and Likht’s “Protsesiye dray” (Procession Three, 1925) represent powerful expressions of each writer’s stake in the question of what a Jewish American culture should look like, and how the Jewish American writer should function within it. Both poems respond, in many ways, to Eliot’s The Waste Land (1922), which, according to subsequent critics, communicated its author’s vision of the modern Anglo-American/European cultural condition. Yet, whereas Zukofsky’s “Poem Beginning ‘The”’ satirizes Eliot’s“master” modernist poem in an attempt to conceal what Charles Bernstein calls the“fault line for high culture” which this work established, Likht’s “Protsesiye dray” echoes The Waste Land’s bereaved tone by mourning the deterioration of a Jewish literary tradition as pure as that of Anglo-American/European literature. Zukofsky’s and Likht’s Jewish American modernist poetics clash in these two poems over a basic question of opposing linguistic orientations: while Zukofsky’s poetics rally for an English language literature inclusive enough to incorporate a Jewish American cultural experience, Likht’s poetics insist on a Yiddish language literature exclusive enough to stand on equal footing with Anglo-American high modernism. Zukofsky’s“Poem Beginning ‘The,’” which he published at the age of twenty-two in the literary journal, Exile, does more than allude to The Waste Land—it openly challenges it. As the young poet writes to Pound in 1930: ‘“The’ was a direct reply to The Waste Land…intended to tell him why spiritually speaking, a wimpus was still possible and might even bear fruit of another generation.” The poem begins its “direct reply” from the dedication: “Because I have had occasion to remember quote, paraphrase, I dedicate this poem to Anyone and Anything I have unjustifiably forgotten. Also to J.S. Bach—309…” Yet, as John Tomas notes, “This is a dedication in name only”; what follows is an assortment of notes to the intertextual references included in the body of the poem. These notes are eclectic, ranging from “Bede’s Ecclesiastical History—248” and “Beethoven’s Ninth Symphony—310” to “Modern Advertising—163,” “Mussolini—74” and “Myself—130”. Zukofsky’s glosses take a deliberate and aggressive jab at The Waste Land. Where Eliot includes footnotes at the end of his poem, which (beyond any rhetorical significance) appear to be functional and sincere, Zukofsky’s notes are impractical and absurd: they are ordered alphabetically (not in the order that they appear in the text), and precede the poem. Rachel Blau DuPlessis notes that this act of inserting “the end beforehand” begins the poem “in a scandalous formal pun on Jewish ‘backwardness’ (whether the non-acceptance of Jesus as messiah or the insistence upon Moses seeing only the backside of God, Exodus 33:23)”. Additionally, Zukofsky’s“end beforehand” is entirely nonhierarchical, noting “Henry James—2ndMovement” next to “Title, Jewish Folk Song—191” in a gesture that overtly undermines Eliot’s brand of high literary tradition. Citing Canto IX of The Infernoin line 10, Zukofsky accuses the English modernists of a heresy comparable to that of Dante’s heretics, who are “imprisoned in stony sepulchers and subjected to eternal fire” (Tomas). Yet the heretical behavior of these “Oedipus-faced wrecks” is less religious than cultural; while Zukofsky struggles to find traction for his Jewish creative output in New York, these English modernists produce“[r]esidue of self-exiled men” from“the Tyrrenian” and “Paris.” They have divorced themselves from the world deliberately, a sin Zukofsky can neither comprehend nor forgive. He is particularly critical of Eliot, asking, “And why if the waste land has been explored, travelled over, circumscribed,/ Are there only wrathless skeletons exhumed new planted in its sacred wood…[?]”. Eliot’s quest for a viable Western culture within “the waste land” of modernity has generated nothing more than a collection of recycled relics to be reburied in his “sacred wood.” Zukofsky does not deny the existence of a “waste land” in the first movement of “Poem Beginning ‘The,”’ but, rather, submits that it is the modernists themselves, as self-exiles, who have conjured this modern nightmare: “And the dream ending—Dalloway! Dalloway—/ 53 The blind portals opening, and I awoke!” Zukofsky’s“exile,” on the other hand, is imposed from without, allowing him a perspective on the potential of modern culture that is much clearer than Eliot’s and the other Anglophone modernists. Like “… Spinoza grinding lenses, Rabbaisi” Zukofsky intends to offer a credible alternative to the “Broken Earth-face” of English modernism in his poem at any cost. “Askforaclassic, Inc” refers to the Great Books method of instruction at Columbia, which Professor John Erksine had introduced a few years before Zukofsky’s arrival at the university. Zukofsky parodies Erksine’s method by using low “Modern Advertising” lingo; yet he clearly feels strongly about the Great Books ideal at Columbia, which make “a Jewish boy” into “Plato’s Philo.” The classics of Latin and Greek antiquity, he suggests, which Erksine adopted as the standard source texts for Columbia’s English Literature program, leave no room for a Jewish American student’s own literary history. The Jewish American student must give up his distinct cultural narrative, digesting the standardized English literary tradition“[l]ike those roast flitches of red boar” [where “flitch” = bacon]. Zukofsky rebukes Erksine, the Columbia University “Engprof” and his Great Books method, equating his literary philosophy with Eliot: “Professor,” he writes “from the backseats which/ 182 Are no man’s land!” The “waste land”—“the no man’s land”—is not something which high Anglo-American culture has discovered, Zukofsky suggests, but, rather, something it has created. 188 Gathered mushrooms while you mayed. 190 A stove burns like a full moon in a desert night. 253 I might as well look Shagetz just as much as Jew. 257 Twist red hot pokers into knots. 261 Having learned, so to speak, in their colleges. Zukofsky speaks through Shakespeare’s Shylock here, (“the villainy they teach me I will execute,/ and it shall go hard with them”) proposing an act of vengeance against the Anglo-American cultural institutions that have prompted him to abandon his Jewish heritage in order to“pass.” He has “learned, so to speak, in their colleges,” and now “look[s] Shagetz [gentile] just as much as Jew;” but, though he has changed his “spots” through assimilation, his Jewish cultural past remains with him. This cultural past provides him an opportunity as an English-language poet “to better the instruction,” that is, to plant new literary flowers, mongrel Jewish flowers, in the “long dry…sacred wood”. 326 Myriad upon myriad shall be. 330 Myriad upon myriad shall be. In opposition to a poetics of suffering (Heine’s grossen leiden), Zukofsky’s Jewish American poetics are “against nothingness joy;” they “call out of pure might” and “open arms wide” to pull the Jewish American experience into English. 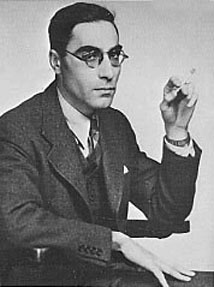 Zukofsky’s translation and adaptation of Yehoash’s “ruins” (lines 318-330)contradicts the “ruins” of Eliot’s The Waste Land, which signal a fractured, irreparable past. Zukofsky’s “ruins”of the “myriad years” of history gesture instead to the “[m]yriad upon myriad [that] shall be.” “Poem Beginning ‘The’” concludes with an optimisitic look to the Jewish American future, a future that will communicate its Jewishness fluently (and fluidly) in English.